There was other stuff I was going to write about today but those great bombastic anthems are still ringing around my head, from watching it on the telly last night, so I might as well stick with that. I’ve always watched the Last Night of the Proms. It just one of those things that has always drawn me in. Mostly I tune in for the second half, when the party atmosphere reaches its zenith and the hits come fast and loud. Last night’s was a good one. Ruthie Henshall sang a Mary Poppins singalong medley and Roderick Williams beamed his way through ‘Rule Britannia’ in a most amiable fashion. The conductor speech by Sakari Oramo was as smiley and top-lip-sweaty as is required and the Promenaders bobbed and weaved as only they can. As usual, I really enjoyed it. Am I not Irish? Shouldn’t all that rousing British patriotism rile me just a bit and make me want to switch over and watch something else instead? Well, no. It never has. And I am Irish. In fact, I'm about as Irish as they come. I don’t for an instant see why any of the flag waving and patriotism should alienate or threaten me. It’s my neighbour country, partying-down and singing some of their big songs, waving their flags and strutting their waistcoats. They’re having great fun doing it and I’m having great fun watching them. What wins me over most is the positivity of the whole thing. I love positive things and the Albert Hall is replete with positive people on that evening. They love the music, the silly traditions, the pomp, the circumstance. It doesn’t have to be my ‘thing’ for me to enjoy it. I just do. This all goes to something I was thinking about myself over the last few days. I always tend to react positively to stuff whenever I can. If it’s bad, it’s bad and there’s no getting away from that but, if something is even half-good, I will tend to focus on the half-good part and run with it. It’s a thing I like about myself and I also think it’s rather a good thing. I see a lot of people, out in the social media world (and in the real world too) who seem to sit quietly in wait of something negative to come along and then it is their meat and drink. They tear at it and chew it until they find they nourishment there. Then they retreat and wait for the next negative thing upon which to sup. I don’t envy them. I’m glad I am the way that I am. One year, back when I lived in London, Patricia and her sister Una and me took a journey to the Albert Hall to watch the last night promenaders go in to the concert. There was a great vibe outside and we really enjoyed seeing everybody in their garb. When most of them had gone in, we set off around the circumference of the hall to head back home. As we passed a rear exit door, it swung open and attendant stuck his head out. We were the only ones around. “There’s some room up on top,” he said, exactly like a bus conductor might. We took it, of course we did. We watched the whole 1992 Last Night from the highest balcony in the room. The overview was simply tremendous. Kiri Ti Kanewa performed that aria from La Wally. You know, the one used in ‘Diva’. She sang ‘Rule Britannia’ too. It was a tremendous, memorable evening, made all the more special by the shock and surprise of actually getting in. It was twenty two years ago, last night. So thanks for letting me in, London. To the concert and to everything else too. I’ve never been to a Prom. I’ve actually only ever been to a handful of orchestral concerts—to differentiate from pop concerts (I’ve only been to one of them)—a couple of ballets, another handful of plays, a musical (the same one three nights in a row) and not a single opera. Looking back it’s a sorry wee list. Actually it’s a decent enough list but you would’ve thought considering who I am that it’d be much longer. I know when Carrie and I got together we talked about going out more and we did which is why I’ve been to as many things as I have because without her this list would’ve been abominably short (which I’m reckoning is worse than simply embarrassingly short but maybe not). I used, for example, to pick up a programme every year for the Edinburgh Fringe and every year there was always something I really wanted to see and every year I never bothered. I did take Carrie through to Edinburgh when we first got married and she couldn’t pronounce the word (she still struggles) but we never took in a show and we’ve never been back. Even Messrs McKellen and Stewart tackling Didi and Gogo didn’t have sufficient pulling power. Maybe a rekindled Beckett might manage it. The thing is I’ve enjoyed every thing I’ve gone to see. I even enjoyed the Blondie concert despite the fact the Glasgow audience was so exuberant you could barely hear the band and we left halfway through their set. So why so few live events? I’m not sure I have an answer. As a kid the simple answer was there was nowhere to go. There was the pictures and that was it. I did watch a lot of films growing up. It felt like every Saturday you’d find me there in the queue waiting for the matinee but I was in my mid-thirties before I saw my first live performance of a play. 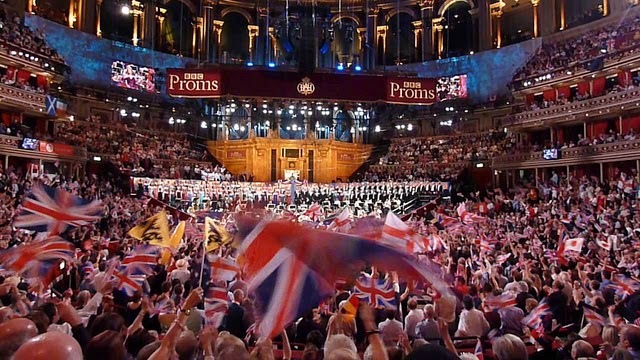 As far as the last night of the Proms goes I’ve seen a few on TV but I can’t say I watch them faithfully. I know I wouldn’t enjoy actually being there; rowdy crowds frighten me nowadays. I appreciate all sorts of classical music but I don’t care for the lighter end as much. I’ve saved one concert from this year’s run to watch—the Maxwell Davies and Birtwistle concert from September 11th—but that’s it. Birtwistle’s a composer I struggle with—I actually switched off a Prom one year during a performance of his Trumpet Concerto—but I don’t like to be beaten. Except when it comes to opera. Opera won and I’ve no intention of asking for a rematch. I guess this would be your theme tune. If I’d played this for my dad he’d’ve spent the rest of the day wandering round thinking he was Bing. Oh, and the song’s reminded me: I watched Noah last week and I think even you’d be hard pressed to accentuate the positive there. I've been to the RAH on numerous occasions - particularly when I worked for BBC Radio many, many years ago but I, too, had never been to a Prom until last year. It wasn't the last night but it was still magical. There's a great deal to be said about being in a place where you really want to be and with other people who want to be there just as much as you do. And the music was wonderful too!